Raijintek MYA RBW is designed with the latest German design concept and development combined with multiple number of patented technologies to achieve high stability heat dissipation and manufacturing quality, MYA RBW have enhanced wave type heat sink fins and optimized airflow passages, with all-black coated body and cool 5v ARGB lighting effects, excellent performance, strong gaming appearance are most suitable for gamers with unique styles. 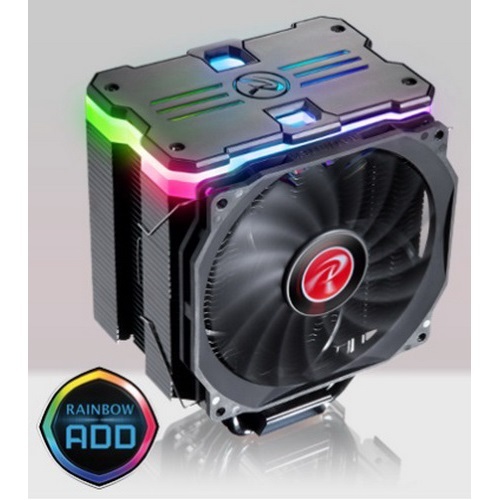 MYA RBW comes with CDC base (CPU Direct Contact) material, 6 high-performance 6mm heat pipes and patented wave-shaped heat sink fins to give you superior cooling performance, compared to other same sizes CPU cooler that are nearly 50% more heat dissipation area higher than others. It also came with a 12013 ultra-thin PWM fan so you won’t get interference with your memory or other device due to the huge fins. It also came with a well-designed multi-function CPU mounting kit that allows you to install in all types of motherboards. The performance combined with the huge heat sink fins and cool lighting effects, MYA RBW is really the best for people who pursuit appearance and performance.